Bone broths are a staple food in many traditional cultures. People around the world made variations of healing broths using the entire animal, not a pressed bouillon cube they got from the supermarket. From Asia to South America, each culture uses different animals as the base of their broths. They all take it a step further and turn that broth into a range of foods from stews, to sauces, to cooked vegetables. You can use bone broth in any recipe that calls for stock and it adds amazing richness to cooked legumes and grains as well. 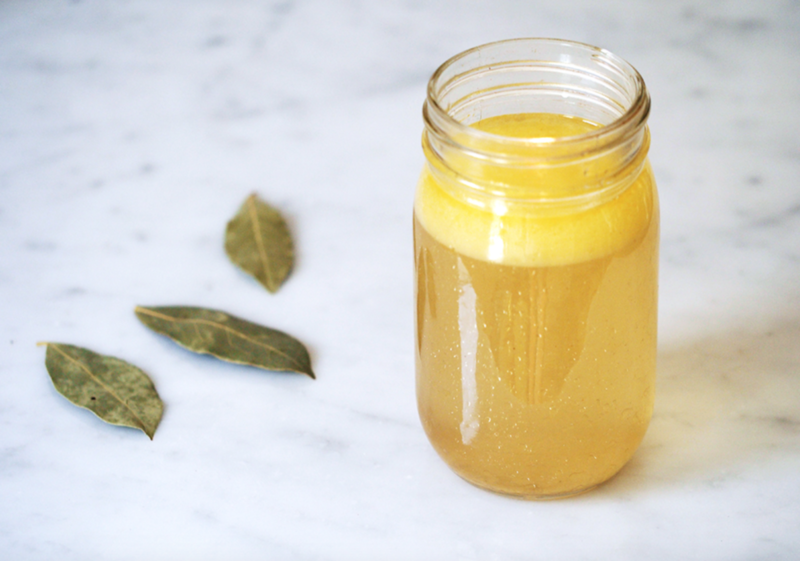 Bone broth is a deeply healing food. I started drinking it over a year ago to nourish my body, support my digestion and prepare my body for conception. I know. I started the preconception phase super early but with my history of being a little low in minerals and hormone imbalances I wanted to get everything in smooth order long before it was time to conceive. I continue to drink bone broth each day because it has helped my body heal in ways I didn’t think possible and making it has become a ritual that I cherish. Place the bones in your crock pot. Cover completely with clean water. Add the vinegar and cover. Let sit for 1 hour. Adding the vinegar helps the bones release more of their nutrients. Set your crock pot on the lowest setting. Simmer at that low setting for 72 hours. Allow to cool completely before storing in the fridge in glass or in the freezer in a container of your choice. Roughly chop the fennel, chard stems, carrots, celery, leeks, lemongrass, garlic and add them too a large stock pot with the broth. Next add the parsley, cilantro, bay leaves, astragalus, and reishi powder. Bring to the lowest possible simmer and simmer for 1 hour until all of the veggies are well cooked. Drain the veggies and add to your compost. Serve warm with a bit of miso stirred in and a squeeze of lemon.